The history of Mount Athos Area is brilliant and counts around 2500 years. From Xerxes to Thucydides, from Aristotle to Alexander the Great, and from the Byzantine Era to the glorious struggles for the liberation from the Turkish rule. Our first stop the historic town of Arnea, mentioned in Thucydides as Arni, passed also from Vrasidas during the Peloponnesian War. For reasons that we do not know, that ancient city was destroyed. On its location though, in the following centuries were built other settlements. In 1478, the land of Paleochori (mezraa) was recorded as property of Ottoman state, which was not resided. Between 1478 and 1519 the village became a Christian one and since the mid of the 18th century was referred as member of famous Mademochoria. Its residents took part at the revolution of 1821, when they fought intensely at the Macedonian war. Until 1928 the village was called Liarigovi. 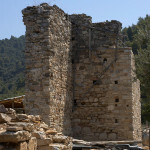 Paleochori also belonged to Mademochoria: its residents according the Ottoman tax lists, from 1478 until 1568 are recorded as workers of the mine Sidirokafsia. The area of Neochori is being referred since the 19th century as an area close to Yenikov (turkish) or Bovoselo (slavic), probably named this way in contrast to the neighbouring Paleiochori. In 1793 Neochori was visited by French Consul from Thessaloniki, Espirit m. Cuisinery. In the “Voyage dans la Makedonie”, he describes a potential settlement and closes his 3paged report with Paleochori and the Paleochorian, who hosted him, with the historical phrase “with great regret I was se perated from this Greek”. 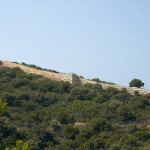 Paleochori was destroyed after the Turks’ victory. Surely it is worthy to mention that Nikos Kazantzakis inspired his “Life and Times of Alexis Zorbas” (formerly published in French, Editions du Cheme, 1947, B. pub in Greek, Difros, 1955). At the location Retsini of Varvara (close to villages referred above) was discovered a currency, belonged to the era of Emperor Anastasius (491-518 AD), along with old Christian lamps made by clay and female earings by silver. These buildings were destroyed by Slavs during the decline of Byzantium and were abandoned around the 14th century, by the installation of Giouroukes. 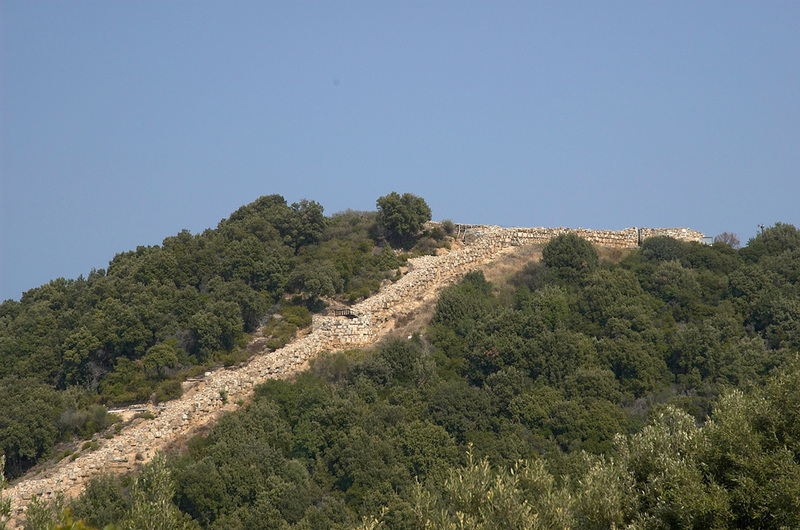 Ruins and big jars were found scattered in various locations (Glavina, Drevenikos, Zernavos), when three castles surrounded the village to protect the mine excavation, closing this way three passes: towards Egnatia and the lakes, towards Olympiada, Ancient Stageira and Ierissos. Serbs, Turks, Croats, Germans, Jews and especially Bulgarian miners, who all came to work at the mines. The villages were twelve: Galatista, Vavdos, Ravna, Varvara, Liarigovi, Novoselo, Mahalas, Isvoros, Horouda, Revenika (Megali Panagia) and Ierissos. By a firman of April 1705 we learn that the rays of Mademochoria ask to grant them the exploitation of the mine, paying their wages, provided that “they keep this mine and its parts from the enemies and from malicious attacks of themselves, so as nobody to be able to cause any damage to it. If the enemies would cause any damage to it, and they could achieve it, then they should accept to collect all money of the state, since then paid in order to improve the mine”. The privileges given to the miners had been renewed, according to another firman of 1773, which was addressed to Kadis of Thessaloniki. The area was headquarter of an official, who had military force under his disposal so as to protect the mines, but despite his political or police force, he did not have the right to interfere in the internal affairs of the Community. Each of one of the twelve villages had its own community administration and all together elected twelve leaders (one of each village) and those four “velekides”, who constituted the central government. The flag of the Revolution was raised in Mademochoria on June 3, 1821. What concerns the name of Stratoniki, it is believed that came from the sister’s name of Macedonia king Perdikka, who built city Stratonikeia to honor her. During the Ottoman Rule, the village was developed due to the mine production. 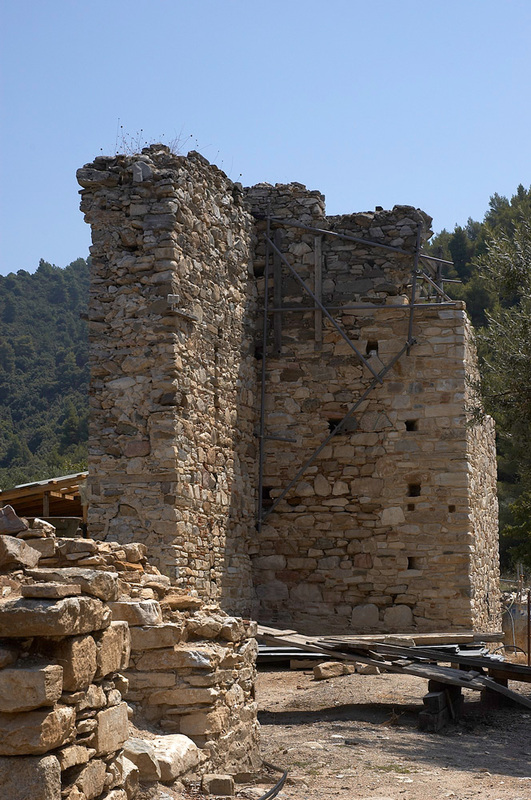 Stratoni was inhabited since the ancient times when its mining activity dates back to 600 BC approx. 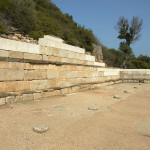 Our historical trip reaches Ierissos, which during the ancient times was named Acanthus. 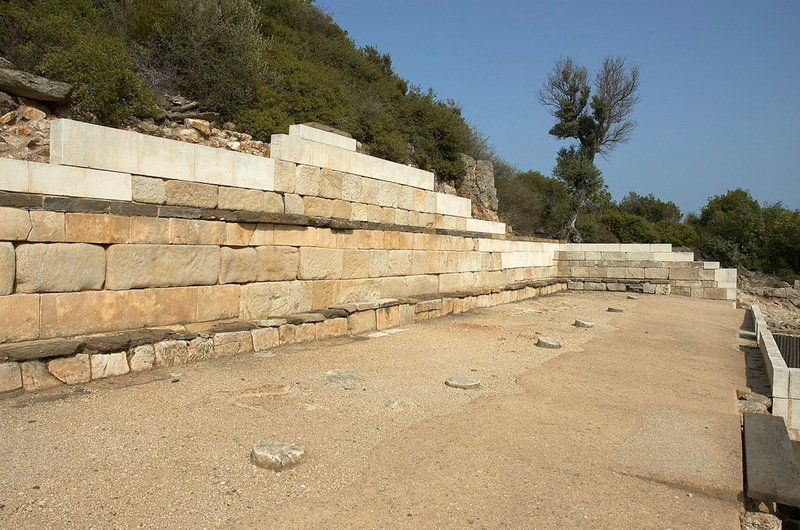 Ancient Acanthus is located on the northeast side of the Coast, the eastern peninsula of Halkidiki, at today’s location of Ierissos. Thucydides refers to it as Acanthus, and Plutarch as a mixed colony of Andrians and Chalkideans, founded “on the coast of the Dragon”, on the location of a pre-existing culture. 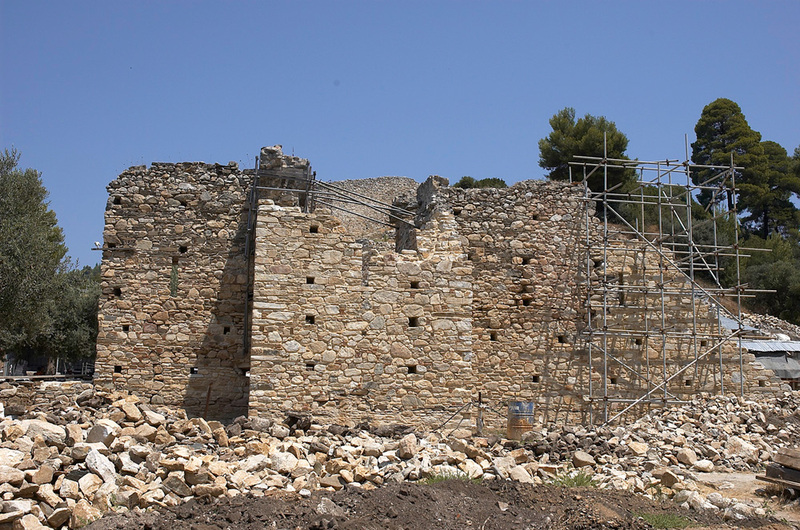 According to Eusebius and archaeological data, the possible date of its foundation is 655BC. Its financial resources were coming from the mineral and the forest wealth, but also from the agricultural and livestock, which were transported from its remarkable port. The early history is not known. Its development during the archaic period is reflected from the wide circulation of its currency, starting around in 530 BC, having as an emblem a lion killing a bull. At least 92 types are known. The first historical evidence, from the late of 6th century, relates the city to the Persian wars. As a free city, Acanthus was originally member of the Athenian League and later of the Spartan. 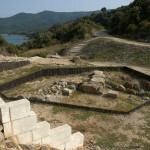 In the early of the 4th century BC, a period of great prosperity, the city resisted and never joined the Alliance of Halkidiki. In 348 BC was conquered by the Macedonians, without being destroyed. Later incorporated at the area of Ouranoupoli, a new city founded on the isthmus, between the Gulfs of Strymoniko and Siggitiko, by Alexarchos, brother of Cassander. According to Livius, around in 200 BC the city was besieged by the Romans, who used the natural sources of wealth and its port. The life of Acanthus continued throughout until the later Byzantine years. 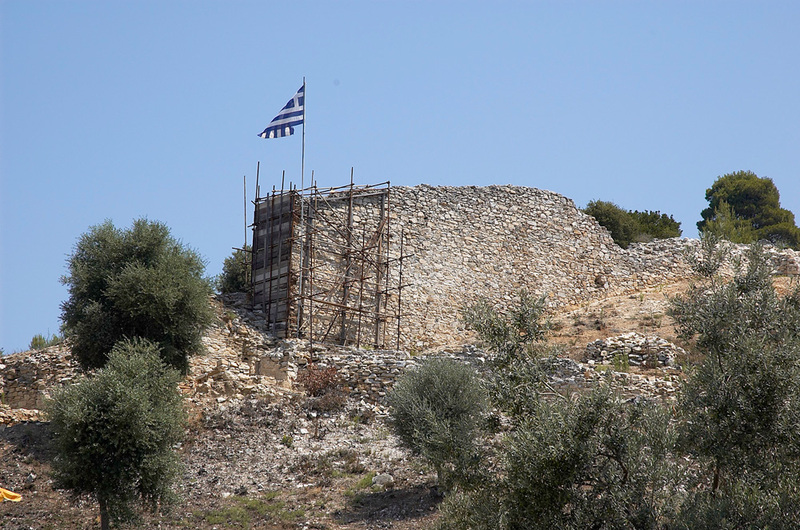 The ancient city extends on a picturesque hillside, 600 meters southeast of the village of Ierissos, where are kept remains of the walls, an impressive part of the citadel, scattered architectural and building remnants of the Hellenistic Period. 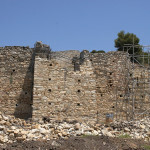 In the same archaeological site are also preserved ruins of a Byzantine church and two post -Byzantine. In contrary to the necropolis, Acanthus has not been systematically excavated, whose research started in 1973. 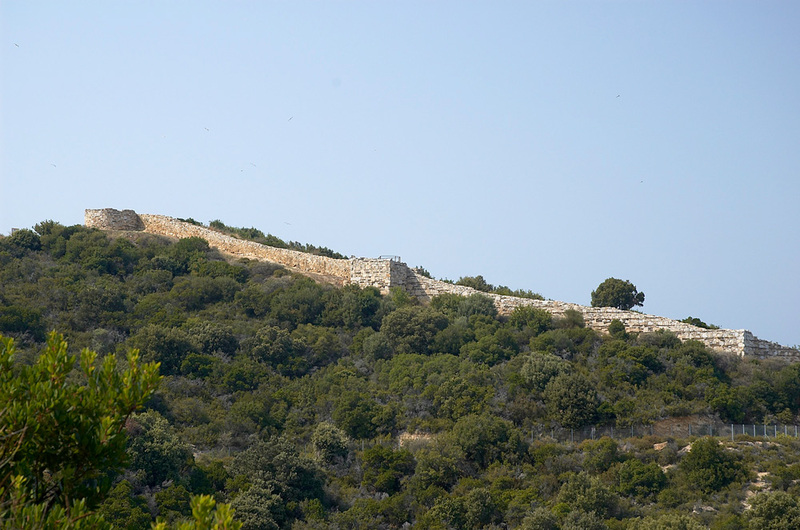 The extensive area possesses the coastal part of Ierissos and counts until nowadays more than 600 tombs, used for a long period, from the Archaic Age to Roman times, and later probably with some interruptions, until the 17th century. The tombs are spread over two or three successive layers, or shallower layer in the soil, or even in the sand. The layout of the tombs area is usually parallel to the coastline. The orientation of the deads is, in most cases from the southeast (scull-neck vessels) to the northwest. At Acanthus, adults and children were buried in the same place, according the known burial customs of antiquity, in which dominates the burial procedure. There were used various types of graves, such as rectangular or simple pits, simple or with clay, or clay urns, container-shaped, usually plain, sometimes embossed or with paintings, cist graves, tile and pot burials, in jars, smaller pots, vases, urns, which constitute the largest percentage of infant and child burials. The offerings (kterismata) which are usually placed in tombs or over the dead are numerous and various: among them pottery, either for solid of liquid food. Sometimes offerings that accompany deads can be their belongings, or related to their occupations or personal life, such as jewels, pins, brooches, mirrors, knives, hooks. Weapons are rarely found. It is often in women and children burials to find clay figurines depicting chthonic deities, various female and male figures, actors, animals and others. Findings present a braod typology and origins. They represent famous shopping centers of the ancient world and various workshops, when in the same time they show the parallel development of the local production. Related burial customs, similar types of burials and artifacts are found in lots of cemeteries of Macedonia and Thrace, revealing effects, contacts and trade connections with both Greek-speaking East and with famous centers of island area, such as Euboea, Athens, Corinth and Boeotia. The Acanthians initially allied with the Persians, later with the Athenians and then with the Spartans. In 199 BC the city was looted by the Romans, who distributed it to legionnaires. 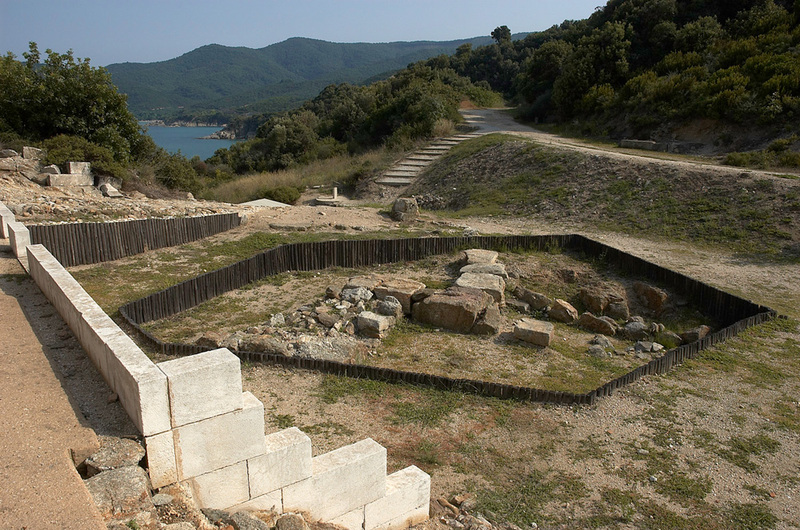 For some period the Romans were permanent residents of the area, and named it Ericius, meaning Erissos, later becoming Ierissos. The excavations began 25 years ago at the cemetery of Acanthus, right above of the today’s location of Ierissos. More than 9000 Classical and Hellenistic tombs have been found and researched, and most of the findings are in the Archaeological Museum of Poligiros. At the north of the area is the village of Olympiada, the place where are found the findings of the Hellenistic city, the birth land of Aristotle. The city was founded around in 655 BC by Ionian colonists, coming from Andros island, while later arrived and settlers from Chalkida. After the Persian Wars, Stagira became a member of the First Athenian Alliance, contributing to the common fund. During the Peloponnesian War, more specifically in 424 BC, the city was deserted by the Athenians and allied with the Spartans. This angered the Athenians, who tried to siege the city but without result. Later Stagira joined the Public of Halkida. In 349 BC the city was besieged and later yielded to Macedonia’s king Philip II, who devastated it, to found it again from the beginning some years later, in order to honor Aristotle. It seems though that this destruction marked the start of the city’s decline. For this reason geographer Stravon, who lived at the time of Jesus Christ, noted that Stageira was deserted. 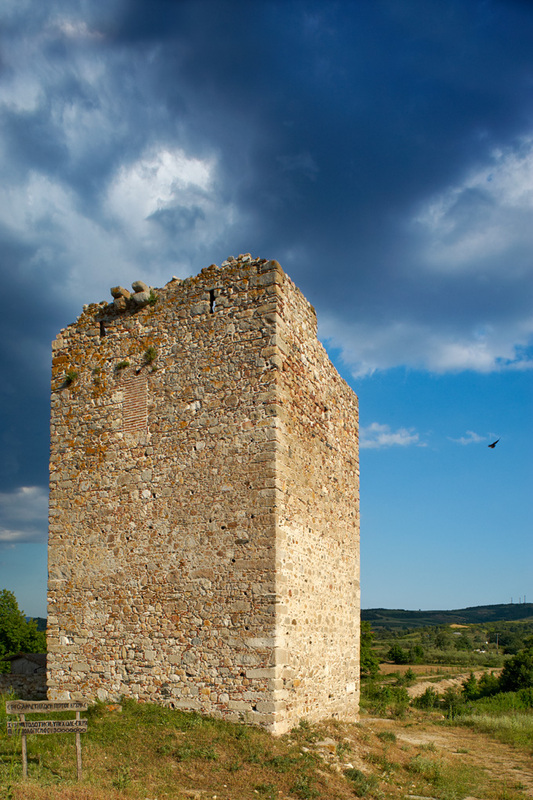 A thousands years later, at the same location, is indicated the existence of a small medieval castle, with the name of “Livasias”, later “Lipsasda”. At this castle probably belong the few buildings at the top of the north hill, and the byzantine wall as well, which surrounds the hill. Reaching Nea Roda, the village which was founded in 1923, at the location “Provlakas” from the refugees coming from Roda of Propontida, we see the 1800 meters narrowest part of the peninsula, through which Xerxes passed his fleet in 486 BC to conquer Greece. 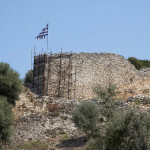 Ouranoupoli was founded in 315 BC from Alexarchos, brother of Kassandros, who built the city on the ruins of ancient Sani, destroyed by Philip II. The currencies that were found, it is written on them the words “Sky City” and “Ouranidon City”, with the form of Aphrodite Urania. Ouranoupoli used to be former property and metohi of Vatopediou Monastery. 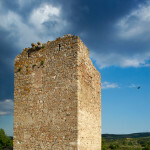 At the southwest is the Tower of Ouranoupoli, dating from the 14th century. After 1922 the tower was inhabited by refugees, mostly from Marmara, and the Lock couple that came in 1928. Ouranoupoli took its current name around in 1960. Gomati owes its name to refugees that came from Gomati of Lemnos. According to one other version, the name comes from supervisor Gomato, who supervised the area under the administration of Mount Athos. 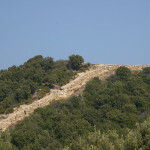 The village used to be metohi of the Iviron and Xeropotamou monasteries. Pirgadikia was founded by refugees, after 1922, who came from village Afthone. The village is built on the location of the ancient city, with the name Piloros. The name derives probably from “the field of Gardikeia”, as mentioned to documents of Docheiariou monastery of Mount Athos in 1057.